Here is a good composite for your cat’s food: Protein 32%, Fat 18%, Fiber 3%. Sound good right? Well what if you were told that this in the composite from a pair of old leather boots, used motor oil, and a scoop of sawdust? Wow. Not that appealing after all. Especially for our cats. 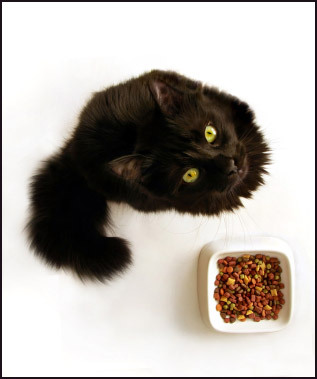 So what makes a good quality cat food? Well for starters, cats (unlike humans and dogs) are carnivores. They absolutely need meat and better cat foods will have real meat as the first ingredient. You want muscle meat rather than by-products, little to no grains, and WATER. Due to this water requirement (ESPECIALLY important during a cat’s senior years) a high quality canned food is better for cats because it has considerably more water. Beware of starches as some companies will use them to substitute for the grain. There are some great brands out there that offer high quality cat food – the trick is to research these brands, or simply refer to this forum link for great information on quality pet food for your cat. I am a rancher having aged to 75. My father was a great teacher. Nature still is our classroom. Most animal species have particular differances, and also differant needs for habitat and diets. Our two neutered cats are 16 years old, living in the barn, like our prior cats. They love mice and small rodents number one, then small birds. Very natural to them. This also gives them exersize as they have to work to survive. In the winter months we supplement with chicken and beef trimmings used in the food we make for our ranch dogs. We love all our animals and experience has convinced us not to trust any company that uses waste grains,organs,meat,and fish laced with any preservatives or chemical. Unfortunately not all of us are country folk but keep in mind the cat, who likes to stay a cat. I prefer to remain a human in charge of the cat.